Happy belated Halloween! Due to the freak storm last weekend (! ), Halloween activities were a bit diminished this year, so I was glad we had already been to the Pumpkin Sail the weekend before when the weather was so beautiful. 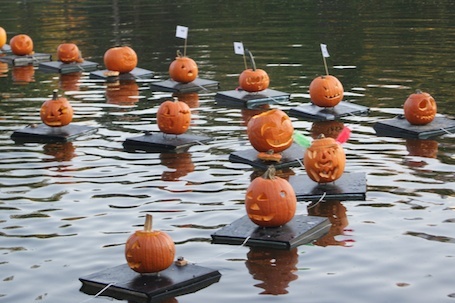 Every October, the Central Park Conservancy holds their annual Halloween Parade and Pumpkin Sail on the Harlem Meer at the north end of the Park. After hearing a fellow parent rave about this, we decided to carve up a pumpkin and go see what it was all about. 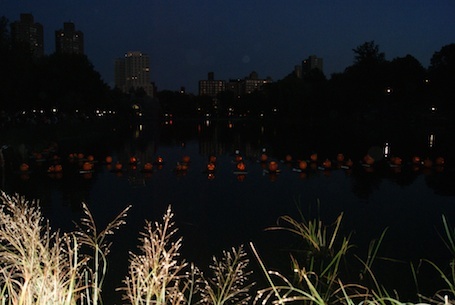 Arriving at the park, we turned in our pumpkin and watched as dedicated high-school students wearing waders placed them onto floats and put a candle in each. As you might imagine, this took awhile, but the timing was perfect because they finished just as the sun was setting. 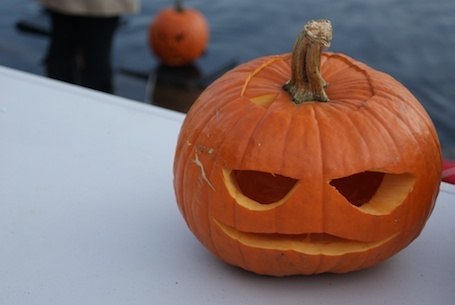 About that time, a witch paddled up in a kayak, attached the pumpkins to her boat and away they went! This entry was posted on November 3, 2011, 6:26 am and is filed under inspiration, kids. You can follow any responses to this entry through RSS 2.0. You can leave a response, or trackback from your own site. wow! this looks beautiful. we just got back from nyc and loved central park more than anything. if we are ever there in oct – we will make sure to see this. It is amazing – worth a trip to NYC in October, even. I can’t believe we have lived here 16 years and just found out about it! I’m thinking it will become part of the Halloween tradition around here for sure! Those photos are magical. How can anyone not love NYC after seeing that. I feel very lucky that we missed the snowstorm the weekend before.